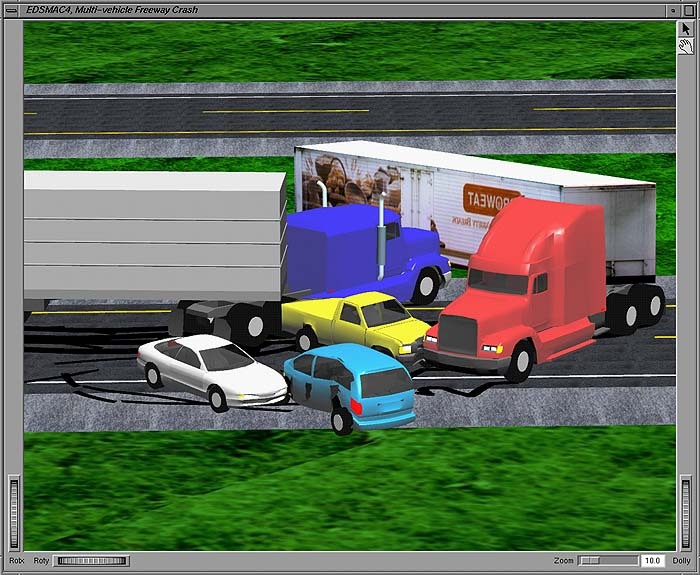 Description EDSMAC4 is an HVE-compatible simulation analysis of vehicle collisions. Any number of vehicles, trailers, and/or barriers may be included. Based on the SMAC model originally developed by Calspan for NHTSA, EDSMAC4 includes numerous extensions developed by EDC. The user enters the initial position and velocity for each vehicle in the study. The user may also enter driver controls (steering, throttle and brakes). Using this information, EDSMAC4 calculates tire, collision and inter-vehicle connection forces at user-specified time intervals. The simulation then calculates the resulting vehicle positions, velocities, accelerations and damage profiles for each timestep. The results may be displayed numerically in a spreadsheet format or visually in 3-D viewers. Researchers may use EDSMAC4 to predict and visualize how crashes occur. Typically, the user is interested in vehicle initial velocity, velocity change (delta-V, a measure of crash severity) and collision damage. By using HVE's 3-D viewers and attaching the "camera" to the driver's position in any vehicle, avoidability studies are inherent to the analysis. EDSMAC4 also produces a collision pulse that may be loaded directly into any HVE-compatible occupant simulation model. Tire vs 3-D terrain interaction is modeled transparently to the user, and extends the original SMAC model by calculating quasi-static longitudinal and lateral load transfers, as well as roll, pitch and Z based on the local terrain. This powerful technology, developed by EDC, allows researchers to easily study crashes on irregular surfaces, such as hills, ditches and road crowns. At each timestep, the EDSMAC4 tire model queries the environment to use the current elevation, surface normal and friction beneath each tire. The trajectory model has also been extended to allow the user to simulate vehicles with tandem axles and dual tires. Tire blow-outs and wheel displacements can also be simulated.